Popular social media user Aisha Alubankudi throws shade at single Nigerian women whorefuse to marry polygamists. 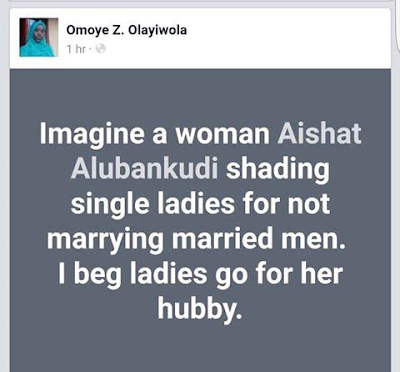 A Facebook user didn't find the statement funny so she has urged women to go for Aisha's husband. However, unperturbed Aisha stood by her statement. In fact, she has advised married women not to divorce their husbands over extra marital affairs. 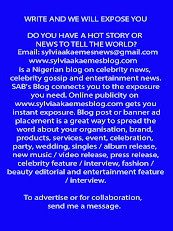 "Truth is bitter, Omoye you will agree with me in future. Let me use this opportunity to plead with married women, pls dont divorce your husbands because of his extra marital affairs, it's now a norm all over the world, most men are polygamists but majority are doing it illegally for peace to reign. You leave him for adultery or for marrying another woman, walahi you will also become another husband's extra marital affair in future. Actually other men's concubine. I'm just being realistic, nothing controversial"